Having difficulty to choose between Portable Playstation versus PS3 Slim with the first one emphasizing on portability while the latter offers much greater visual experience with relatively larger screen? If you are looking for an accessory that can transform your PS3 to something portable and can be carried around, here is a very innovative product that you can consider. 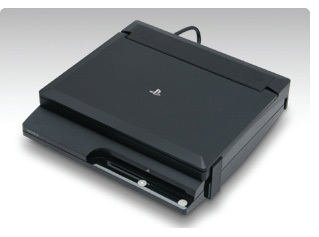 Named as HP3-87 designed by Hori, it is a docking station with portable display that being customized to fit any PS3 Slim console suitable for those that would like enjoy gaming with high flexibility and mobility. Being equipped with a flip-open 11.6-inch screen, the docking station is capable to display up to 1366 x 768 resolutions so that users can easily run any gamig and media playback at 720p HD (High Definition). While this is far below what can be achieved by its built-in Blu-Ray player, but it is more than sufficient to fill up a 11.6-inch diagonal size screen with reasonable good pixel quality. Other display specifications include 500:1 contrast ratio, 200cd/m2 brightness and a 7ms response time which is not too bad for a portable gaming console. And as expected, the docking station comes integrated with internal stereo speakers, earphone jacks as well as component AV outputs. That is not all, it is even compatible with Torne, a DVR/TV Tuner module that being designed to work on PS3 earlier, making it an all-in-one multimedia and gaming solution for all. Measured around 295 x 255 x 55mm and at a suggested retail price of $280, the HP3-87 will be commercialized on May 27 for Japan market first and potentially be released to other regions since it is able to support both PAL and NTSC format.